As you browse, you are sure to stumble across a few Persian recipes on my blog. They way Persian cuisine combines flavors with creativity is like art. One of the flavor combinations that I absolutely love is cardamom and rosewater. It is used in many of their sweets. 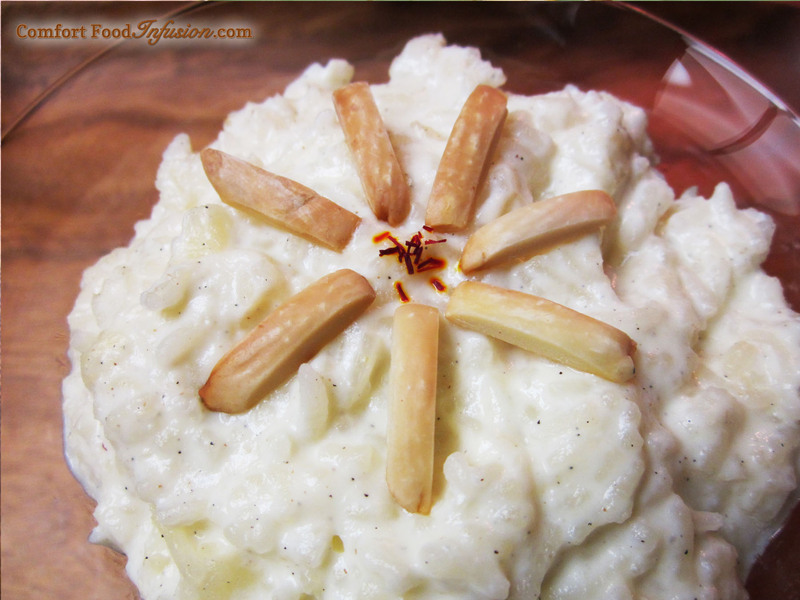 One day, I was craving rice pudding… plain old, “American” rice pudding. As I began gathering my ingredients though, I developed a craving for Persian sweets as well. Naturally, I grabbed cardamom and rosewater and gave it a shot. Oh man. Soooo good. If you are not sure about these flavors, but would like to make a more traditional version, you could simply omit these two ingredients and add in some vanilla instead. Regardless, this slightly sweet desert is a perfect one for this time of year…. or any time really! 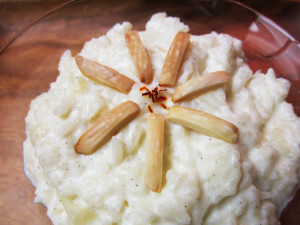 A creamy, slightly sweet rice pudding. Cardamom and rosewater give it a wonderful Persian flavor. Combine cooked rice, 2 cups milk, sugar, rose water, and cardamom in a medium/large saucepan. Bring to a boil then reduce heat to a simmer. Stirring often, continue simmering for 15 minutes. While stirring constantly, slowly add the beaten egg and 3/4 cup of milk. s\Stir in the raisins (if using). Cook on low for another 10 minutes or until desired consistency is reached. If you like your pudding thinner, add more milk. Serve in bowls garnished with saffron and toasted nuts (if using). *Start with 2/3 to 3/4 cup uncooked rice. Prepare according to package directions. **I like mine really creamy, so I substitute with either half and half (1 cup milk and 1 cup half and half) or cream (1 1/3 cup milk and 2/3 cup heavy cream). Ginger, I wanted to tell you I found you by looking for a nut burger receipe. My favorite nut burger TACO was at a small restaurant across from LA City College many many years ago. The nut burger sounds great. I also have enjoyed perusing your other receipes as I adore Persian flavors as well. The pomagranate meatballs, rice pudding, cilamtro sauce are all in the must do list. The date pineapple in turkey bacon…reminds me of a current version of rumaki. Thanks for sharing as I do enjoy your flavor profile.